A subtle mix of strategy and luck in a new mechanics! 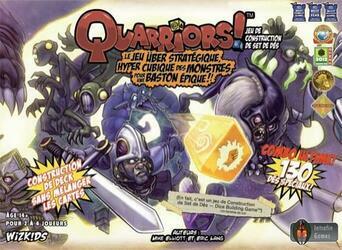 As Quarriors, powerful mystical warriors, cast powerful spells, summon your fierce creatures to defeat your opponents. You must make strategic choices each turn: will you use your quiddity to summon creatures to score glory points or would you rather spend it all to capture powerful squares from the wilderness? Avoid your opponents' traps by skillfully casting spells, controlling powerful squares, and finally, crushing your opponents' creatures to gain more glory!